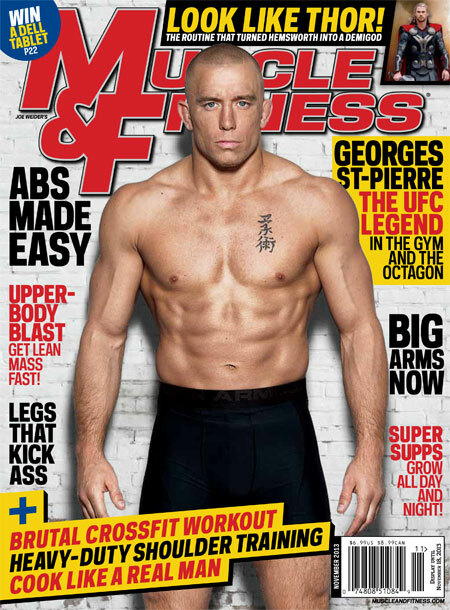 Grapple With Georges St-Pierre in the November M&F! Get in the Octagon with the legendary UFC fighter plus build a demigod body with the Thor workout. "Nobody is invincible. It makes me remember that I need to work hard for what I have." It's been six years since Georges St-Pierre has tasted defeat served up by Matt Serra, and it's a jagged pill he doesn't want to swallow again for the rest of his career. But winning streaks this long don't just manifest themselves out of thin air. They come through sweat and pain, innovation and dedication, and a burning desire to always be the guy whose hand is raised at the end of the fight. In our November issue, GSP tells us how he keeps on being that guy. Plus: The intense program that for Chris Hemsworth in Norse god shape for Thor: The Dark World; the ultimate heavy weight and body weight combination workout routine; high-protein meals you can make in your microwave, and more! Ready to get into the Octagon with GSP? Grab your copy today, M&Fers, and get in UFC shape!